Accountable Care Organizations may not be the Affordable Care Act's buzzword, but this shift in how insurers, hospitals, doctors, and patients approach health care could transform this sector - and make smart investors rich. Obamacare's arrival has sent tidal waves of change cascading across the health care sector. From millions of new insurance subscribers to fresh regulations and new taxes, insurance companies, health management firms, and investors all have been affected in a big way by the Affordable Care Act's grand ambitions. While top insurance stocks like Aetna (NYSE:AET) and UnitedHealth (NYSE:UNH) have made the most of Obamacare's launch for shareholders in 2014, the future's still under construction in the brave new world of this sweeping law. Yet Obamacare's biggest public brand, its new state- and federally run insurance exchanges, aren't even the changes that could bring the biggest benefit to America's bloated health care spending. Enter Accountable Care Organizations: These new initiatives may be flying under the radar, but ACOs have the potential to create huge benefits for the U.S. economy – as well as for savvy companies and smart investors. Accountable Care Organizations are part of a new push under the Affordable Care Act to cut back on wasteful spending and promote health- and value-conscious decision-making in the Medicare system. But they've expanded beyond that into private insurance too, potentially transforming how American health care is delivered. How does this ambitious goal work? ACOs form as hospitals, doctors, and insurers -- or a mix of providers -- join up to build coordinated health care networks. In this way, the entire health care team, from the payers all the way down to the patients, can work together more efficiently to cut back on spiraling health care spending and maximize the value of a patient's treatment. It's all about bringing efficiency and cooperation to an American health care system that today is notorious for its paperwork and costs. The growth of big data in the health care sector, along with ongoing pushes into electronic health care records, should only help ACOs grow in efficiency and cost savings in the future. Pilot programs have showed some success: Aetna reports that the Center for Medicare and Medicaid Services's pilot ACOs came up with $380 million in cost savings. There are critical advantages here for virtually every member of the ACO. Insurers and hospitals like Tenet Healthcare (NYSE:THC) can offer bonus payments to doctors who keep down medical costs, thus cracking down on their own medical costs. As McKesson reports, more than two-thirds of projected medical payments could be tied to their value five years from now. That's an incentive for doctors to cut out unnecessary tests or overly long hospital stays, allowing patients to return to normalcy sooner while hopefully easing the pain on the wallet, as well. Of course, the biggest advantage may be at the highest level. The U.S.'s health care expenditures as a percentage of the economy have exploded -- far outpacing fellow OECD countries in spending and growing into a huge question mark for the American economy in the future. ACOs alone won't solve all of the health care sector's problems, but it's a step in the right direction – and they're making good progress in expanding around the country. The Kaiser Family Foundation reports that ACOs, as of mid-April, serviced around four million Medicare subscribers, with hundreds of provider groups also joining in. Leading companies have turned toward ACOs in this new health care revolution, and the move might be good for you in more ways than one. In addition to keeping you healthy and keeping costs down, ACOs – and those companies that make the most out of them – could add a healthy dose of rewards to your portfolio. Which companies are harnessing this potential? For forward-thinking insurance companies concerned about the rising pace of medical costs, ACOs could be a huge way to keep costs under control. Aetna is America's third-largest publicly traded insurer, and the company's done a good job leading the way into the ACO sphere among the largest players. By the end of last year, Aetna serviced more than 500,000 total members in its ACO networks, with 32 organizations in all. In 2013 alone, the firm inked deals for 17 new ACO plans. According to Zack's, the firm's aiming to end 2014 with 60 ACOs in its portfolio. Considering that Aetna's done a good job recently of keeping its medical costs under control, the ongoing push into ACOs bodes well for this stock over the long term – even after its near-20% run-up year-to-date. Yet other insurers haven't sat still in this new wave. Humana (NYSE:HUM) recently inked a deal with Mercy to launch an ACO in Southwest Missouri that the insurer aims to open up services to four states in the Midwest. In all, the ACO incorporates 33 hospitals and more than 2,000 doctors in a broad shot to increase value in the Humana system. That's a big deal for a company that saw its operating cost growth outpace total revenue growth by a full percentage point in its most recent quarter, particularly if Humana investors want to see this high-flying stock continue to beat out its rivals as it has in 2014. Fellow insurance giant UnitedHealth's gone all-in on ACOs as well, as the company released last summer that it plans to more than double its value-based ACO contracts to $50 billion by 2017. It's a huge investment from the market's largest insurance firm, and if UnitedHealth manages to meet its goals of improving patient outcomes while generating more bang for their buck, it'll please investors in the long run as well. 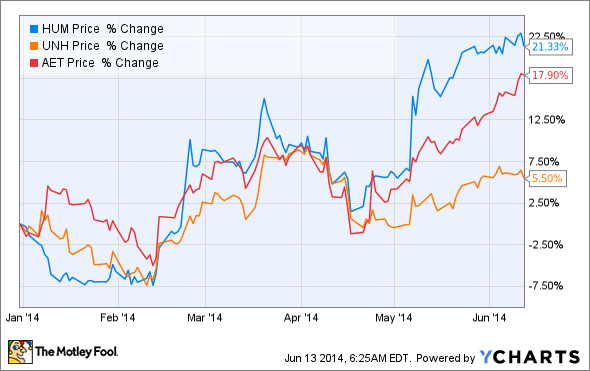 Big hospital stocks are also at play here, as Tenet Healthcare's pushed hard into ACOs. The company inked a deal for an ACO with Blue Cross and Blue Shield of Texas late last year, aiming to improve coordination of patient care for Blue Cross and Blue Shield members at Tenet's Texas hospitals starting next year. That comes after Tenet's deal last year to acquire Vanguard Health Systems in a $1.7 billion deal to expand its hospitals and ACO footprint (Vanguard had previously been a leader in the ACO movement), and with consolidation on the rise in this industry, Tenet's size bodes well for maximizing value and efficiency generated from ACOs. Accountable Care Organizations are still a work very much in progress, particularly as health care analysts and players continue to understand the impact of the Affordable Care Act across the country. But for companies and patients concerned about the rise of health care spending in the U.S. – with the serious hits on Americans' budgets and on leading firms' balance sheets – ACOs could provide a huge boost to slowing down growing costs and maximizing value. It'll take the rise of technology and more in health care to make the most of this wave, but companies like Aetna capitalizing on ACOs now look to be the biggest winners of this revolution down the road, both for its financials and its investors.